CONGRATULATIONS, Grady, Marquis, Caleb, and Xavres! [Memphis, TN] The Blues Foundation's 26th International Blues Challenge ended on Saturday January 23rd, 2010 with two packed shows at the Orpheum Theatre. Out of 224 bands that competed for top honors throughout the weekend only two can be called winner in the solo/duo and band competition. 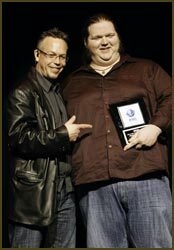 The solo/duo winner was Matt Andersen, sponsored by Harvest Jazz and Blues fromFredericton, New Brunswick, Canada and second place honors went to Alphonso Sanders and Bill "Howl-n-Madd" Perry from Mississippi's Crossroads Blues Society. The top prize in the Band competition was awarded to Grady Champion of the Mississippi Delta Blues Society of Indianola. Second place honors were earned by Karen Lovely Band, Cascade Blues Association, and the third spot went to Cheryl Renee with Them Bones, hailing from the Cincinnati Blues Society. The finalists in the solo duo category were: Becky Boyd & Tim Matson (Cleveland Blues Society); Jimi Lee with PB Shane (Austin Blues Society); Sherman Lee Dillon (Central Mississippi Blues Society); Tom Walbank & Arthur Migliazza (Southern Arizona Blues Heritage Foundation); Ken "The Rocket" Korb (Long Island Blues Society); and Steve Cohen (Grafton Blues Association). The finalists in the band competition were: Mojo Theory (Pomeroy Blues & Jazz Society); R&K Brew Co (West Virginia Blues Society); Big Boy Little Band (DC Blues Society); Sonny Moorman Group (Columbus Blues Alliance); Jesse Greene Band (Ottawa Blues Society); Jackie Scott & the Housewreckers (Baltimore Blues Society); Labron Lazenby and LA 3 (Smoky Mountain Blues Society); and The Avey Brothers (Iowa Blues Societies).